“God is great, God is good,” is not just the beginning of a prayer for God to bless our meals that we teach our children – it is the absolute truth about God that not everyone has seen. Until people have seen the greatness of God they think either they are His equals or that they can manipulate His power. Until people have seen the goodness of God they think either they are as good as He is or that they are better than He is. At the root of mankind’s sin is self-esteem – we value ourselves more than anything else and each one is his own god. This truth that at the root of mankind’s sin is self-esteem – valuing ourselves more than anything else – may appear that it is not absolute, but it is. Let me try to explain how this works so that we can see that self-esteem is our root sin problem. We readily admit that those with an unmistakable high self-esteem are “full of themselves.” What is not so easily seen though is that those with low self-esteem are also “full of themselves.” The problem for those with low self-esteem is that along the way their self-esteem has been overshadowed, dominated, and depressed by either others that would not acknowledge their worth or their own actions that diminished their self-worth. People with low self-esteem are miserable. They cannot achieve their desired goal – glory from others – ascriptions of worthiness from others. So, whether one has high self-esteem or low self-esteem (or somewhere in between), he or she desires praise from others – he or she wants to be valued by others. This desire exists in every person because it was the sin that Adam and Eve committed when they disobeyed God and listened to the lie of the devil that they would “be like God” if they ate from the forbidden tree. The desire to be like God (self-ruling, self-sufficient, great, good, worthy of praise, etc.) is so deeply ingrained in fallen mankind that its only remedy is its uprooting by seeing the greatness and goodness of God. We must see His glory! John wanted his readers to know that the glory of God is seen in the Person of the Lord Jesus Christ. “And the Word became flesh, and dwelt among us, and we saw His glory, glory as of the only begotten from the Father, full of grace and truth” (John 1:14). John selected specific events out of the ministry of Jesus so that we too could see His glory and value Him as our Lord and Savior. First, the glory of the Lord was seen at the wedding in Cana (John 2:1-11). There both the greatness and the goodness of the Lord were seen. The Lord’s greatness was seen in His ability to turn water into wine. The Lord’s goodness was seen in His concern for a poor family unable to meet the needs of their wedding guests. The worth of the Lord was revealed – “and [He] manifested His glory, and His disciples believed in Him” (John 2:11). The Lord is great, the Lord is good. Next, the glory of the Lord was seen at Jacob’s well in Samaria (John 4:1-42). There Jesus encountered a Samaritan woman who was not known for her marital fidelity. She had already had five husbands and the man she was with was not her husband – she was shacking up (John 4:18). What did Jesus do? He told her all about herself and who He was (John 4:18-26). Jesus revealed His greatness through His accurate description of her sin and He revealed His goodness by revealing that He was the Messiah (Christ) who did not come to condemn her but to set her free. What happened? She went and told those in the city and many believed – “From that city many of the Samaritans believed in Him because of the word of the woman who testified, ‘He told me all things that I have done’” (John 4:39). His glory is full of grace and truth! The Lord is great, the Lord is good. Then, the glory of the Lord was seen at Cana through the healing of a royal official’s son (John 4:46-54). This man’s son was at the point of death and when Jesus came back into Cana he implored the Lord to come down and heal his son. Jesus simply said the words, “Go; your son lives” and the man believed the word that Jesus spoke to him (John 4:50). The next day while the man was on his way home his servants met him and told him that his son was alive. The boy got well at the exact same time that Jesus spoke the words, “Your son lives,” and this caused his whole household to believe with him (John 4:51-53). The Lord is great, the Lord is good. After these things the glory of the Lord was seen in Jerusalem at the pool of Bethesda through the healing of a man who had been sick for thirty-eight years and had no one to put him into the pool when the waters were stirred up (John 5:1-14). Jesus saw the man lying there and asked him if he wished to get well. The man answered that he had no one to put him into the pool. Jesus said, “Get up, pick up your pallet and walk” (John 5:6-8). “Immediately the man became well, and picked up his pallet and began to walk” (John 5:9). The Lord is great, the Lord is good. Then, the glory of the Lord was seen in Jerusalem again when Jesus was teaching at the feast of booths (tabernacles) and a woman caught in adultery was brought to the Lord by the scribes and Pharisees demanding that He uphold the Law of Moses and stone her to death (John 8:1-11). Instead Jesus gave her grace, convicted her accusers of sin, and set her free (John 8:7-11). The Lord is great, the Lord is good. 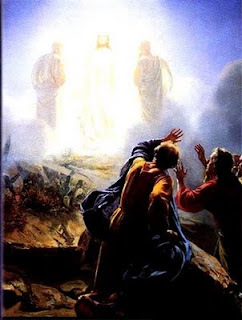 Later that day the glory of the Lord was seen outside the temple when Jesus healed a man born blind (John 9:1-41). This man had a problem that no one else could heal. Jesus had both the power to heal him and the grace to heal him. The Lord is great, the Lord is good. The religious leaders wanted to kill the Lord because He was messing with their glory by revealing His glory. The Lord withdrew to the Jordan and ministered there until His friend Lazarus died and He returned to Judea to do the impossible - He raised Lazarus from the dead after four days in the tomb (John 11:1-45). The Lord is great, the Lord is good. The greatest revelation of the Lord’s glory was seen when He died as a sacrifice for sin, was buried, and on the third day arose from the dead (John 19:17-18, 28-30; 20:11-16). The Lord is great, the Lord is good! Have you seen His glory?